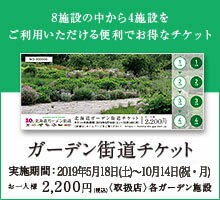 2019/4/11 Ueno Farm XNUM X Garden Open Information! 2018/6/2 Garden event! Ueno Farm's "Bundling Summer"
2018/5/31 Beautiful body make-up walking while enjoying the early summer garden! ! 2017/7/18 Ueno Farm Special Flower Event! 2016/9/26 Ueno Farm The autumn garden is full of charm. 2015/4/21 2015 year Ueno Farm open information!